With BooknRide, a user or an organisation gets the ability to build and design their very own cab aggregator and hailing solution. BooknRide has a very accessible admin panel with different features for the admin to manage different modules. It comes with a user-friendly navigation system which allows tracking through the use of GPS coordinates or map. The app is highly robust and scalable, making customisation of the app pretty simple. BooknRide is a trendsetter for on-demand taxi booking that will help users get started with their own cab hailing business. Start your own taxi booking, ride sharing, cab services app like Uber, Lyft, Grab, Careem, Ola Cabs, Didi, Blablacar etc. 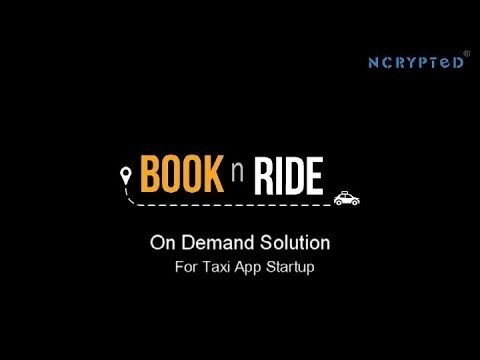 NCrypted's innovative solution, BooknRide, has the best tracking mechanism that outsmarts your competition. You don't want to miss out on the much needed features when it comes to providing the best user experience to your consumers, and at the same time, you don't want to overwhelm your audience with unnecessary features that disturbs the primary objective of such a solution. BooknRide has the right blend of modules required to help you kick start with your own ride hailing app. Q. Can I review the Admin Panel demo for BooknRide? Q. Is BooknRide app available in both Android & iOS? BooknRide app is available in Android and iOS. They are fully customizable. Q. Is BooknRide app available in Web version? We do provide custom solution for web version..
Q. When will I receive license key for my BooknRide software? Within 24-48 hours of payment on business days in case you are buying BooknRide 'as is'. Contact us in case any customization work is required as, in that case, development and delivery time would vary based on your requirement. An agent from our team will get in touch with you as soon as possible to get details about your domain where you want to run the license version, any customization requests etc. in order to get started.